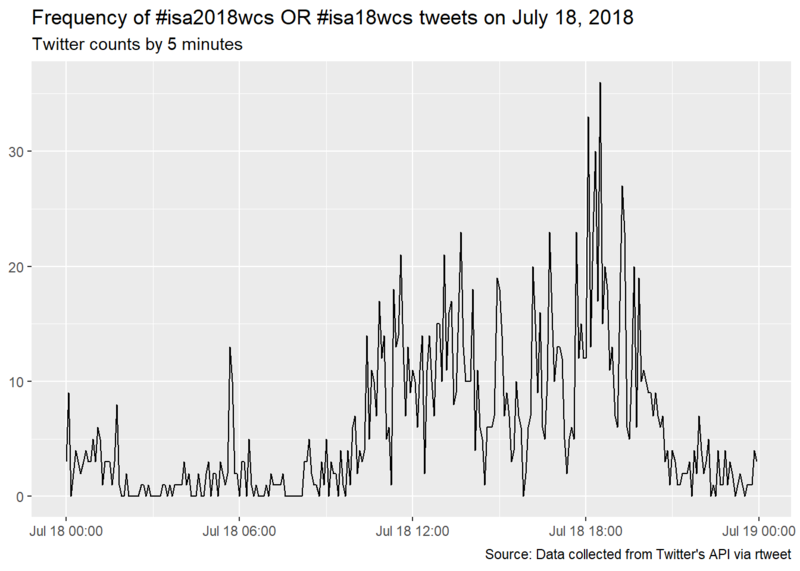 The International Sociological Association 19th World Congress of Sociology in Toronto (15-21 July) has received quite some Twitter coverage. Waiting to board the flight back to Warsaw, I wanted to take a look at these Twitter data and apply the newly acquired skills in text analysis (thanks to the Summer Institute for Computational Social Science, SICSS, Partner Site in Tvärminne and Helsinki, Finland). A few years ago my colleagues from the Polish Academy of Sciences and I wrote a paper about the inequality in national representation at ISA events (congresses and fora) 1. Analyses in this post reveals a different type of inequality at ISA conferences. 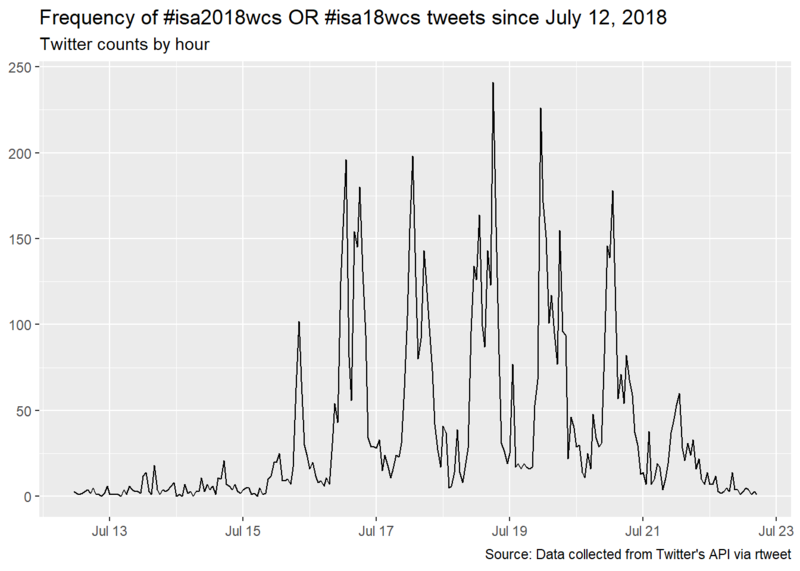 Tweets are an increasingly popular source of data for social scientists, not least because they can be quickly and conveniently obtained through the Twitter API. There are many excellent tutorials about how to connect to Twitter to download tweets, e.g. on the SICSS website. I requested tweets starting with June 1, 2018, but this is unrealistic given Twitter’s restrictions, so I will check what’s the earliest tweet date. It’s July 12 morning. In total the data contain 9401 tweets (including 6478 retweets), around 1500-1700 on Congress days, and much fewer before and after the conference. ##  "We're proud to publish Shirley Anne Tate's #book series Critical Mixed Race Studies (first title in the series, Remi Joseph-Salisbury's \"Black Mixed-Race Men\" out next month). Learn more about the series here: https://t.co/VbuXyDHJg5 or at stand 40 at #isa2018wcs #RC05 @RemiJS90 https://t.co/iOBAivJB2W"
##  "The fabulous @AlaSirriyeh with her wonderful new book âThe Politics of Compassionâ @policypress #booktour #isa18wcs https://t.co/Cto3bXF20Q"
##  "Thanks David Tabara for convening  excellent conversation re. environmental solutions at #isa2018wcs . Thanks for invite to give a pop-up presentation on Sustainable Canada Dialogues  @DialogSustainab . Info on this solution-focused network: https://t.co/liWma5eJu5"
##  "Brilliant performance by the Red Urban Project  to help close #isa2018wcs https://t.co/hFpuiJqwsM"
##  "#Selfie time as #isa2018wcs comes to an end in #Toronto @isarc24 #YYZ @DrAmandaSlevin @HaluzaDeLay @StewartDLockie https://t.co/DswifxJt37"
I want to see the volume of ISA 2018 WCS tweets changed over time: first for the whole period covered by the data extract and on the busiest day - July 18th. Overall it looks like the presentations around noon (11.30am - 1.20pm) and in the afternoon (3.30-5.20pm) were most tweet-provoking. Time stamps include hours, minutes and seconds, so it’s possible to link tweets to concrete sessions, if one is interested. Before the tweets can be analyzed, they need to be tokenized (each word needs to become a separate record = row), and cleaned (stop words and other unnecessary strings need to be eliminated). Here is the list of 10 most popular words. Perhaps not very surprising. Research committees (RC) are the core organizational unit in ISA. Research Committees bring together scholars interested in the same topic, e.g. political sociology or sociology of education. Right now there are 57 RCs. I noticed that many tweets have RC hashtags, so I wanted to see which RC got the most tweets and how equal or unequal the distribution of tweets was. To do this, I count the number of times each RC is mentioned in the collected tweets. I’m assuming that all string patterns rc[digit][digit] refer to a research commitee (some RCs have single-digit numbers, but they are commonly referred to as “RC-O-[digit]”). I’m also assuming that RCs have no other hashtags than with the mentioned string pattern. 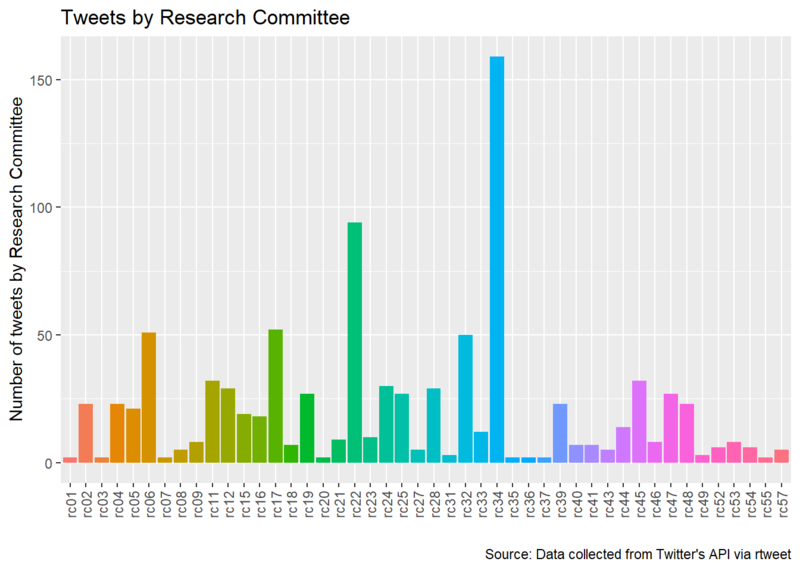 Most tweets mention just one research committee, but some refer to two or more, particularly in the case of joint sessions. Some tweets also refer to the same RC with more than one hashtag, e.g. #rc34youth and #rc34toronto. These instances need to be collapsed to count as one. A simple word cloud reveals the unanimous winner in the RC tweet competition: RC34 Sociology of Youth. 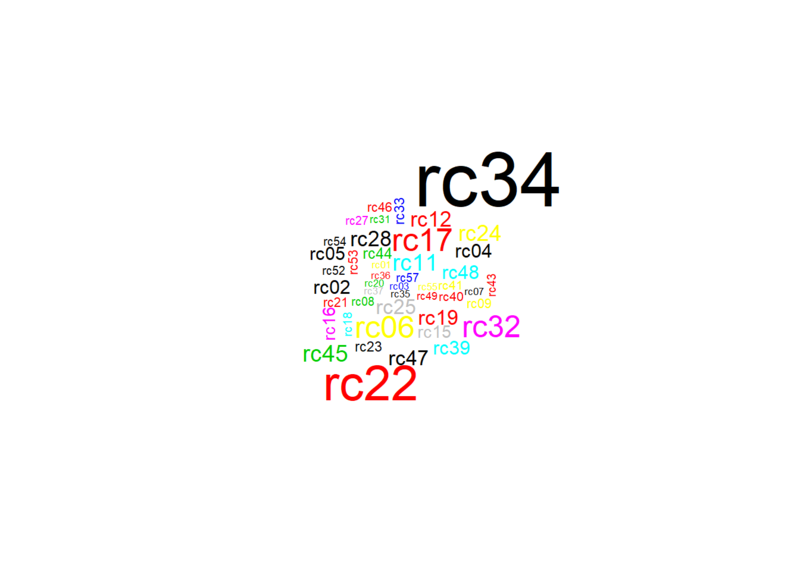 The bar plot confirms this result: RC34 is mentioned in the highest number of tweets and there is quite some variation in the number of tweets across RCs. If there is variation, maybe it can be explained. Some candidates: number of members, age of members, something about the leadership, area of specialization, quality of sessions, number of electrical outlets in the room?